Week 2 with Carla Suto: A Beautiful Easel! Welcome to Week 2 with Carla Suto and "A Beautiful Life"! 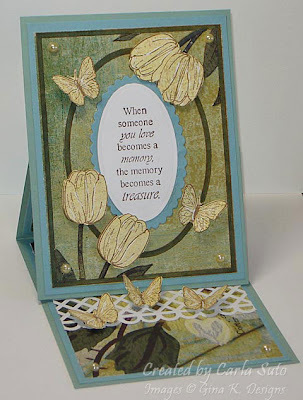 Today Carla made this beautiful easel card with the tulip frame, how simple and clever her design is here, propping up the front with a three-dimensional stamped butterfly and the punched picket fence! If you have never made an easel card, you must try, they are so fun!! I also had a black mat that was already cut a wee to short to completely frame up my DP...but that's okay! You can pretend these offset panels sometimes are just part of your cool sketch! 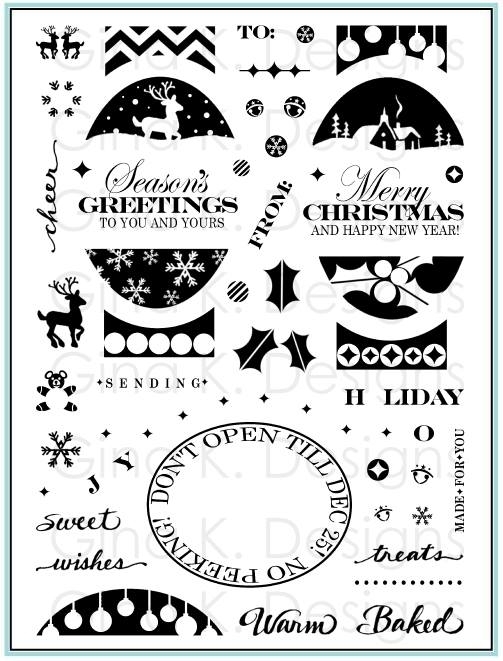 ;) I had just a little white scrap left over so I cut out a petite oval for greeting (this one from "Arranged with Love" , and added a few more black accents with a fancy corner punch and fancy tag die cut behind. The frame is really fun to layer different shapes and tags to change the look, just have fun with it! I am completely out of adhesive pearls, so I improvised by putting a 1/4" circle punch of white CS behind a dewdrop, turned out really pretty!! Have a gorgeous day, thanks so much for visiting! :) Coming up, an altered item and a guest spot with Carla! I love how today's sample with "By Your Side" turned out, and I have to share how it came together! My desk is not TOO terribly messy right now, having cleaned it completely just before our new release sets arrived (to make room!) and while it accumulated a lot of scraps and bits in that frenzy of designing for the previews, I was away for a week on vacation after that so it couldn't pile up as much it often does. I had this little vase of call lilies I'd colored and cut out lying there for before I left (often when I get my new sets I will stamp out a bunch of the images to color while I wait for inspiration on exactly what the concept or design will be for each) and decided I was ready to make a card with it. I noticed I still have a piece of Ocean Mist already Cuttlebugged awhile back, and thought this color looks so calming with the lilies...those swirls look lovely with the flowers' shapes... so here was my mat! I also had a scrap of black and a bit of this ribbon I am already almost out of (because I love it so much!) but it wasn't long enough to tie, so I just made it a stripe and trimmed the ends. This was my very last card base of Pure Luxury White (but more arrived over the weekend, woo hoo! ), already folded and waiting to be finished. I added my last aqua button and a greeting* from "A Beautiful Life" and the card is complete (plus a few adhesive rhinestones) All this stuff was out, no dipping into my stashes! Today's card just focuses on the butterfly and a greeting from "A Beautiful Life"; I really liked the rainbow of colors against the white in this sample, so I used that for my inspiration, plus a LOT of white space in this new CAS layout, adds a lot of drama, no? The Black Onyx and white panels are popped up onto the Pure Luxury White base. I used a piercing template as a guide for the little dotted row I made on either side with a pen. For the butterflies I used YG11 and YG 23 for the green, Y38, YR07, and R46 for the red, BG01 and B05 for the blue, and W-3 for the shadow. I couldn't find my Clear Stardust pen, so instead I used my Sakura Galaxy Gel pen set and traced the details with the matching pen colors, gold, red and sky. Isn't that pretty? Now here is my "souped up" version!! I added this crystal flourish from Hobby Lobby plus one more yellow butterfly I cut out and popped up. I am quickly getting addicted to these crystals!! They come on a clear plastic sheet so you can see how the flourish will fall on your layout, then you just trim out the part you want. (I think I need to go bug Gina to start carrying these!) :) I especially like how this extends off the edge of the black mat over the base, gives it a lot of energy, like this breeze just tumbled in! Lovin how how all the big dots echo the butterfly bodies and little dots go with the dotted detial and their antennae!! Which version do you like better?? ;) Both are actually pretty quick cards! Here is a card I made with "A Beautiful Life" filling in the open corners of the tulip frame with cutouts of the daffodils from Theresa's "Sending Sunshine" set. Aren't these images fabulous together?! I stamped both the frame and daffodils onto Lemon Drop Pure Luxury, and used just three Copics to color everything: Y15 for all the flowers and leaves, leaving the Lemon Drop color of the paper for the lighter areas, and G24 and G94 for the stems and leaves. A little yellow ink was also sponged inside and rectangle and oval frame. TIP: After coloring the daffodils, cut off one side and an angle towards where the stems meet at the bottom, then turn the image sideways on your cutter and trim the other side at a 90 degree angle to side you already cut, the image will now tuck perfectly into a corner! Then you can go in and trim around the petals and leaves at the top with some scissors. Stamp your greeting inside the oval, then pop these added flowers up and layer onto Black Onyx, Fresh Asparagus, and finally a Lemon Drop base. NO ribbon or embellishments here, but I am lovin' how elegant this card turned out! For this card I used both white AND ivory: ivory for the background to make my greeting and white lotus pop. I stamped the koi in Vivid Brick Red to match the Red Hot cardstock (mat is Black Onyx), isn't that sharp in red uncolored? I shaded the white cut out flower with aW-3 Warm Gray Copic, as simple as tracing along the undersides of the petals and drawing a quick stripes down the middles. I popped it up and added a white panel with "thinking of you", also from "Inspiration Mosaic", adding a row of squares below from that same set inked up with markers. I wish I could say I made this beautiful card, but I didn't!! The lovely and talented Carla Suto did and she's hit the ground running with this stunner in her first week as my guest designer for "A Beautiful Life"! 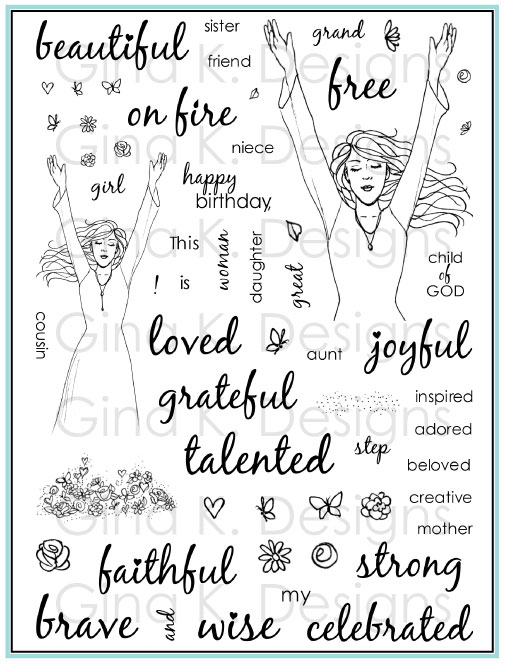 Stamps: Gina K. Designs "A Beautiful Life" and "Arranged With Love"
and now some questions for Carla! FAVORITE GINA K SETS (FROM ANY ILLUSTRATOR) : It's hard to choose from all the fantastic sets, but Asela's Friendship's Garden and Nina's Lovely Shelf are definitely among my favorites. SOME OF MY STAMPING/CRAFTING ACCOMPLISHMENTS: Guest Designer/Featured Stamper on a couple of blogs; being selected for the Center Stage Spotlight Team on StampTV and continuing as an Alumni; being a Guest Designer for Melanie - this is such a thrill and an honor for me! CHALLENGES I LIKE TO PARTICIPATE IN: I try to participate in all the challenges on StampTV. I also participate in challenges on SCS and PaperCraft Planet and on a few blogs when I find ones that inspire me. WHAT I DO WHEN I’M NOT STAMPING:Until last year, I worked full-time in the biotech industry, but now I'm just consulting. When I am not stamping, I am helping care for my 85-year-old Mom who I moved here last summer. I also enjoy casual golf with DH and with friends (I'm trying to improve). Let's go see what else Carla made! Hello! This week several of the Gina K Illustrators are sponsoring the latest Card Positioning Systems Sketch! 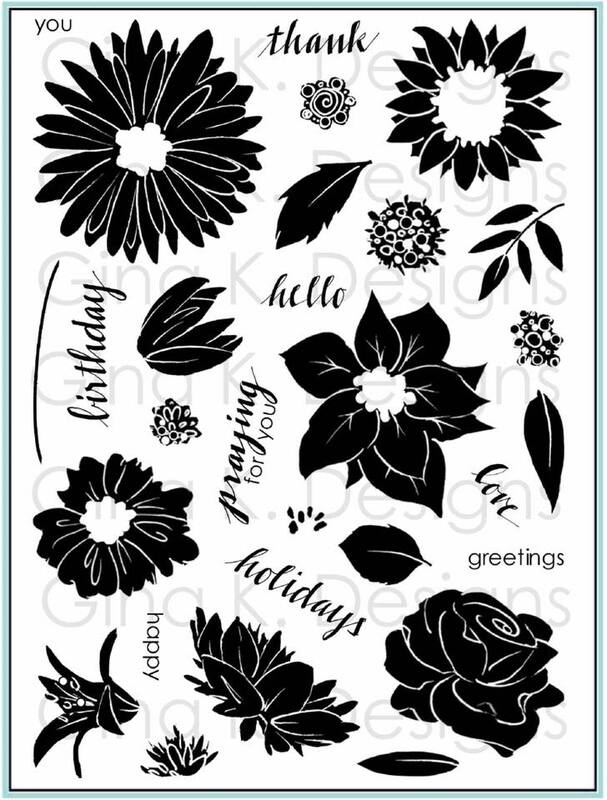 I donated the "Pressed Flowers" stamp set, so I used it in my sample for their sketch. Hope you will go check out the CPS sketch 159 and all the samples made by their team. 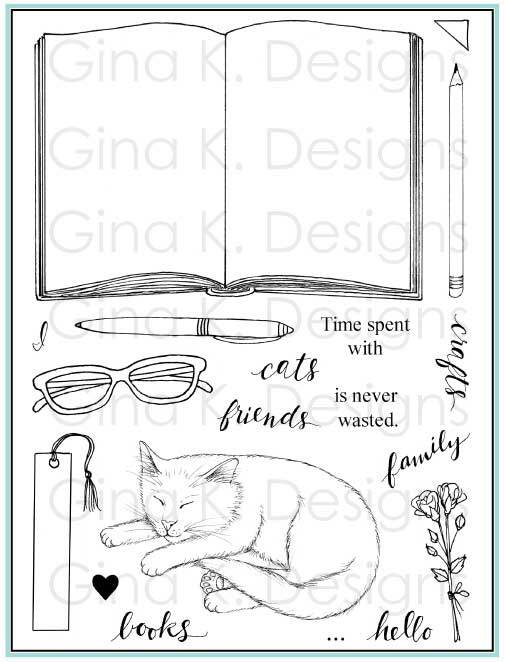 Submit your own creation using the sketch in their Mr. Linky on the CPS blog and possibly win a Gina K Designs set from one of our illustrators! I hope you'll join the fun! Here is the bee card I have "bee"n waiting to make! :) I used Pure Luxury Sweet Corn for my background and Black Onyx to make it pop with the little bee. The newest frame stamp in my collection gives you a beautiful layout for an A2 card in a matter of seconds, with a place to fill with more images, a greeting, or favorite photos. These elegantly arranged tulips will be a favorite and timeless addition in your stamp collection. The tulip blooms are the same size and shape as the tulips in "A Year of Flowers" which make it easy to stamp just the blooms to pop up over the frame for added color and dimension. The frame can be turned in 4 directions to provide you with a variety of vertical and horizontal layouts. You will love the double border in this frame! Similar to that of "Festive Frame", you can color these in any hues you choose to give the illusion of extra layers without adding the extra bulk or time to cut them. Notice however these borders use both a bold and narrow line: when left uncolored, this creates the illusion of a beautifully embossed panel! Fill out the frame even more with your favorite blossoms and leaves from "A Year of Flowers" to create your own custom arrangements! Cut them out and layer on top or mask off the border to stamp them inside. The oval and surrounding flowers create the pefect backdrop to frame a smaller arrangement of "A Year of Flowers" blossoms. Stamp the frame onto colored cardstock in Versamark or a matching ink for a beautiful tone on tone, embossed look. Emboss the frame in silver or gold for an elegant wedding or anniversary card. 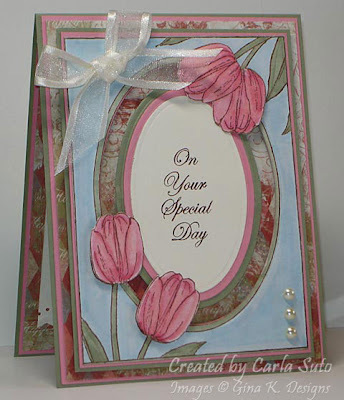 Cut out the oval window to create a window into your card or to layer another color under. Cut out just one tulip corner or the other and pop it up over the corner of a greeting panel on another card, already masked for you! Add buttons, pearls, or punched corners to the open corners to dress the frame up or wrap a ribbon around each and tie at the top or bottom. Color in the corners of the frame around the tulips and/or color the borders to create the illusion of several different mats without all the cutting or adding extra bulk to the card. Stamp onto designer papers to let the beautiful patterns show through. color directly over the pattern to make the tulips and narrow borders pop out without adding extra mats. Paper piece the different parts of the frame to look like quilting. A little bee and butterfly have been added for quick adornments here, as well as provide you with more options for your "A Year of Flowers" and "Arranged with Love" sets. Pop them up in the corner or lighting on the flowers for the perfect little embellishment. 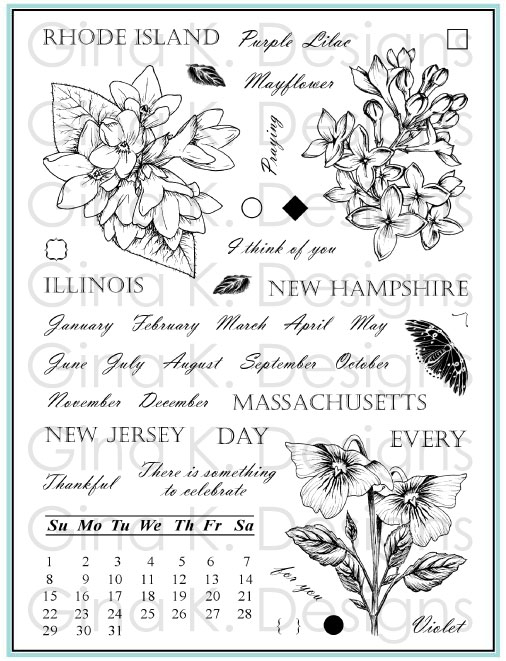 You can also use these new delicate images with any other flowers on your cards to create focal points and backgrounds. Add glitter or Stickles to the butterfly wings for shimmer. Fold the wings in half and adhere the center of the image to your card so they pop out. 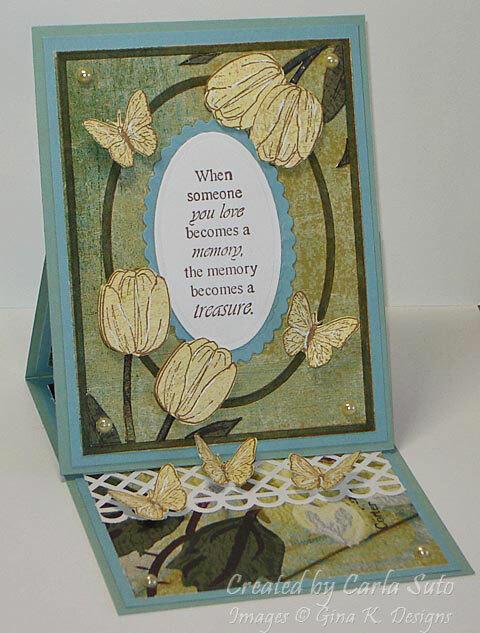 layer a cut and folded butterfly over a stamped one on your card, this creates the illusion of flapping wings! Cut the butterfly straight down the middle, between the antennae and through the body's center. now you have two new butterflies that can be viewed from the side! This gives more versatility to the image, mix these up with the front view and it will look like you have a lovely little swarm on your card. Stamp it all over cardstock or your favrotie patterned papers to make beautiful coordinating butterfly backgrounds. Ink just the "utiful" in "beautiful" and place a popped up bee in front of the word, that spells bee-yootiful! Create a honeycomb background for your bee by inking up bubble wrap and stamping, the result will be hundreds of little holes in a hive! The bee has his own quote: "Hope is the only bee that makes honey without flowers", which can be used for so many occasions. 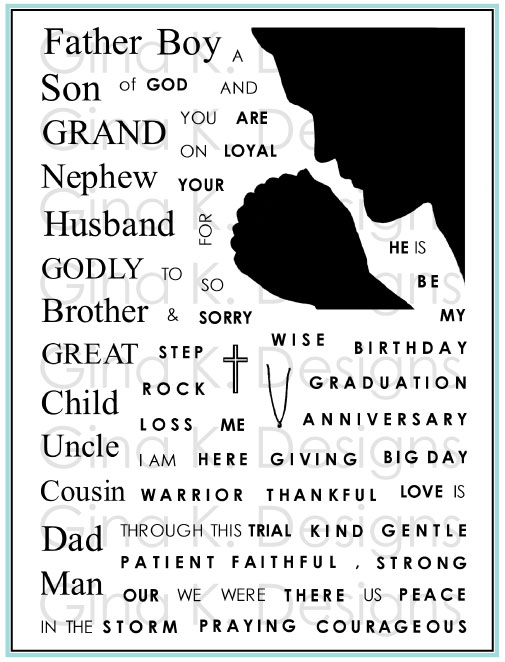 Make him the focal point of your card with this sentiments, yellow, black and white cards are so crisp and cheerful! Add quick color to these tulips using the stems, leaves and blossoms from the coordinating "Pressed Flowers" set. 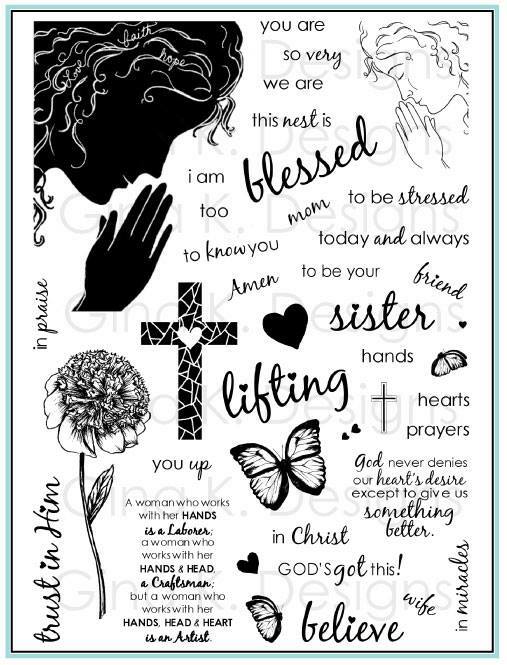 This set includes sentiments for year round occasions like birthdays, anniversaries, weddings and thank yous, as well as sympathy and encouragement. Greetings are sized to fit in the oval whether you orient your card vertically or horizontally. The smaller greetings like "thank you", "friend" and "bride" look beautiful when stamped into the corner of the border or onto a tag. have a beautiful day, wedding (day), anniversary or Mother's day! These classic fonts will never go out of style and can work with so many other images you have collected whenever you need to make a beautiful card, not just for flowers! They also coordinate with the greetings in "Say it with Flowers". 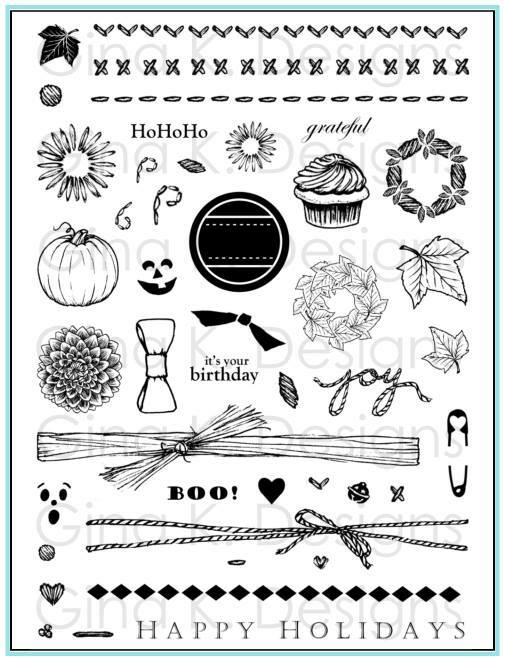 Use some of these new quotes inside your "Festive Frame" set for wintery thank yous and birthdays! Make a beautiful coordinating gift with your cards by adding a photo into the oval window: lovely for a bridal portrait, picture of you and your mother, Easter photos etc. Make a wonderful mini wedding or Easter scrapbook using the stamp to frame favorite photos. Create a bee tag and tie it onto a jar of honey with a little dipper for a sweet gift for a friend or teacher. Use the frame on the top of a painted to altered paper or wooden box to create a gorgeous jewelry or keepsake box, perfect for Mom! The frame creates a beautiful insert to decorate the large acrylic pillow boxes, stamp a greeting into the oval to announce your gift, or cut out the window to allow your treats inside to peek through! The frame would make a beautiful book plate to line the inside of your favorite books and add your name to the middle. Create a matchbook style card or pouch with the tulip frame on the front and add a seed packet inside, truly giving the gift of flowers! Stamp it onto the outside of plain gift bag and color, quick, beautiful and inexpensive! Create real framed art work with the frame, a pretty acrylic message board for jotting notes, or a wine label with the waterproof labels for special occasions. Stamp the frame and a greeting onto Polyshrink, color cut out and make a hole in the corner, the heat. Add a chain and you now have a sweet key chain! Shrink down the bee and butterfly images for charms to use one a wine ring, bracelet or earrings, a book mark, or card bling! Stamp the frame onto an organdy gift bag, another easy way to dress up a little gift! Stamp onto a mirror or pane of glass to make a beautiful sun catcher. Hello! Here is a sample Theresa posted for me at the party, I combined my new "A Beautiful Life" set with a greetings from Nina's "Nana's Sentiments", I thought the rectangular frame would be perfect as a quilt block with the paper piecing technique. The piecing was very easy, you might be surprised how few cutouts were needed to create this card! First I stamped the frame out onto Pure Luxury White, Lemon Drop, and a patterned piece of paper from the new Spring Mix Stamp TV kit. Love that delicate floral! Here you can see how I have cut out the floral to go into part around the ovals and the frame, it's just two large pieces for either corner, plus three more small pieces in between the flowers. Mono Multi or Pro Glider adhesive is perfect adhering the large pieces to the background and Quickie Glue Pen to add those small pieces. As you can see, I cut inside the large border and outside of the oval one. Save the scraps from your cut out for tags or piecing on other cards, too pretty not to use every little bit! TIP: At this point, you could just color in your flowers and leaves with the colors of your choice since the image is open, but I wanted a layered look like a quilt block, with my tulips being a solid yellow, rather than shaded, like pieces of yellow fabric. Next I colored just the stems and leaves with a Pale Olive Copic, leaving the blossoms yellow. I then cut these pieces out whole to adhere on top of my floral. Here they are adhered to the frame. I stamped the stitched sentiment int the oval, inking it up with black and olive markers, then added my little butterfly stamped onto the Lemon Drop as well. The little dotted trail? That is actually created from inking up just a small part of the swirly stitched border from "Nana's Needlework", isn't that fun?? I cropped my frame to leave an additional 1/8" around all sides, colored in with a pale blue Copic to match the DP, then layered onto Black Onyx and Lemon Drop. A few Spring buttons adhered with glue dots in the corners and the card is complete. I am thrilled with the result, and just loving all these sets together!! A Beautiful Life... Stepping it Up! All our March Gina K Designs releases are now available for purchase! So sorry I had to miss the party for the first time in two years (did you even notice I wasn't there??) I am actually out of town right now, have been ALL week, but we come back tomorrow. I was able to pop in for just a couple minutes in the middle from my phone on the way back from the beach, but my son I fear scratched his cornea tonight* so this is a quick post of one of my "A Beautiful Life" card that Theresa uploaded for me during the festivities, thanks Theresa! I stamped the frame on one of the quarter sheets of patterned paper included in the the new StampTV kit and the colored in the flowers and borders with Copics. TIP: I stamped out two butterflies to pop up, cutting one in half, you can use the halves for two side views of butterflies, this is a nice way to change up the image! :) I matted it onto Black Onyx and Bubblegum Pink. Easy peasy! Now here is a quick step it up to add some punched scalloped corners and dew drops if you want to add a little somethin somethin! I wish I'd had my Stardust pen that day, LOL, too! *I'd so appreciate if you could keep my little William in your prayers tonight, I've scratched both corneas at two separate times and it was was the worst! I don't think it's as serious as mine or he'd be having a LOT more pain, but he's very miserable and hurting, and we have a big day of travelling tomorrow and the weekend coming up which makes trying to see a doctor tough. I will have to get my tip sheet for this new set up after we return! Last day of previews, the party is almost here!! We start off tonight with Nina Brackett's newest set, "Nana's Needlework", filled with beautiful sewing and quilting elements. This sample uses the charming country shelf with a separate quilt and bar you can hang from below. After coloring the shelf with Copics, I paper pieced the quilt with two different patterned papers form the new "Spring Mix" StampTV kit (striped background is from the kit, too!) The base of the quilt is the tiny pink pattern and then I stamped it again on the floral, cutting out just a few squares. The triangular pattern you see on a few of the blocks is part of the stamp, these I colored in with Copics, as well. Inside I used more of the patterned paper and created a border cutting two strips the same width from different patterns and then cutting them up randomly like quilt scraps, adding some faux stitching with a pen. The swirly stitched border I stamped over it is part of the set, too (this will be a really fun stamp for makign anythign look quilted, but check back here and at the party for more ideas I have for it!) The large cross stitched "Welcome Home" is from the new "Nanas's Sentiments", a smaller set that coordinates with the needlework stamps, must have greetings in just the right style for those sewing and quilting images! Card base is the new Gina K Pure Luxury Bubblegum Pink, and I LOVE it! This next card uses Rupa's new "Spring has Sprung", the first image that jumped out at me was the darling duckling out for a sail in an umbrella. It went so well with the Cherish the simple pleasures, so I decided to make a whimsical scene for him to float through: Basic Grey's Sugar Rush had this fun dotted pattern that looked a litle like raining buttons! The piece for the water is from the same pack, and I Cuttlebugged this with a piece of Pure Luxury White for the clouds using D'vine Swirl, then trimmed around the curls and popped them up. Ribbon and buttons are Pure Luxury, the base is the new Pure Luxury Red Hot, you will love this fiery new red, too! Jennie Harper - our Guest Designer for this Month! The Release Party is tomorrow night Thursday, March 18th starting at 7pm and ending at 10pm (all times CST) when all the new products will be available for purchase in Gina's online store. Sneek Peek Day 3: Stamp TV Kit "Spring Mix" and "Friends"
Day 3 of the previews, and we have two for you, the newest StampTV kit and the "Free with Three" set, woo hoo! The new kit "Spring Mix" contains a ginormous set of the cutest stamp greetings and images, and a fabulous assortment or card stock, including spring colors and many more, patterned papers plus coordinating ribbons, brads and EYELETS, oh my! A few of the images have a little open space inside to stamp the greeting, one being this shy little mouse holding a sign, I added "Feel Better Soon". 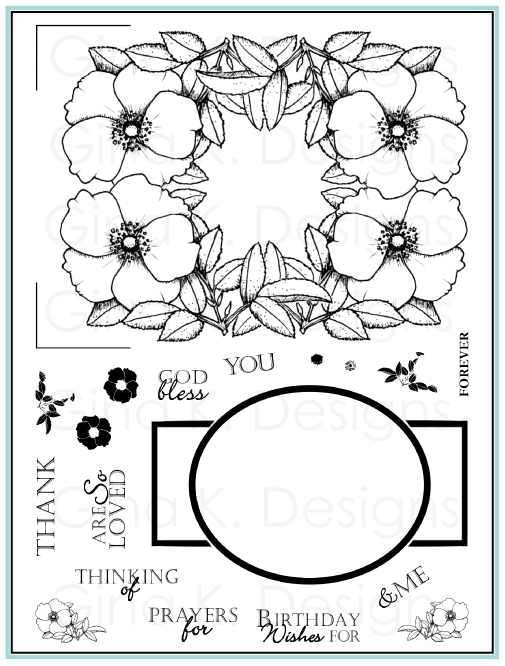 After coloring and cutting it out, I popped it up inside this dashed round border stamp also in the kit, which is perfect for framing up all the images, you will love it! I die cut it with a Classic Circle Nestabilitie. The card base is the new Pure Luxury Little Boy Blue, and don't you love the new beautiful 5/8" grosgrain to match?! I kept this layout simple because I wanted to use one of the patterned quarter sheets in the kit, they are some of the prettiest patterned papers Gina K has ever offered (IMHO) wait til you see them all! I traced around my die to make a small black mat for my die cut and added the green stitched ribbon behind it. I also sponged on a little green ink before removing the die to give it a nice glow. Base is Pure Luxury Lemon Drop. Tune into StampTV for this week's video from GinaK featuring the new Spring Mix StampTV kit! Mark your calendars for the Release Party this Thursday, March 18th starting at 7pm and ends at 10pm (all times CST) when all the new products will be available for purchase in Gina's online store. Everything is colored with Copics, I used this link for help with Koi marking and colors, and sued Strong Red, Apricot and Honey Copics on the fish and tulips. (I've never made any tulips deep orange like this, and I don't know what I was waiting for! The black white and red color combo give the card a very Zen feel, base is the new Pure Luxury Red Hot. Now here is the same card, but I wanted to try to simulate a pool of water for them to swim in, without having to color. A mat of Ocean Mist works quite nicely! :) The cool aqua is such a gorgeous contrast with the Red Hot base. Having the window cut out actually looks like I added two layers, but really it's only once just a larger mat. Which do you like better, I can't decide LOL! Next up is the new Card Kit "Happy Spring". It has an adorable mix of garden images and sentiments, plus some beautiful new patterned papers, I actually used FOUR different prints here for my background and to piece the little hat, gloves, and seed packets! Instead of a traditional card, I made a seed pouch with Pure Luxury Kraft. Cut a piece of CS 4 1/4" x 11, then score at 1" and 6 1/4", then fold. You can hold the bottom part together with staples, matchbook style, or use brads, eyelets, or even just some tied ribbon like I did here and then tuck the front flap under. Here you can see the pouch opened, I stamped another greeting from the set at the top and tucked a little morning glory packet inside. I love the earthy, natural element the Kraft CS gives this project! Are you ready for even more inspiration? StampTV is celebrating it's first birthday and the festivities are in full swing with this month's release! We'll be holding this month's Release Party on StampTV and couldn't be more excited about all that Gina has planned for everyone! The party kicks off this Thursday, March 18th starting at 7pm and ends at 10pm (all times CST) when all the new products will be available for purchase in Gina's online store. Welcome to Day 1 of our sneak peeks! First we have my new set, "A Beautiful Life"! Your response was so overwhelming to my holiday "Festive Frame" set, I just had to create another floral frame that you could use year round, with beautiful greetings for ALL occasions! "A Beautiful Life" features these graceful tulips inside a border and surrounding an oval, to which you can then add your favorite photos, images or the new greetings from this set, and beyond. Tulips are among most people's favorite flowers, and not only for spring, they are the most versatile "occasion" flower, as appropriate for a wedding or birthday as they are a memorial. Creating beautiful cards is a breeze with this set that requires no masking of the images or time thinking about a special layout, it fills up the whole front! A large "beautiful" greeting is included, that acts as a base for most of the other greetings in the set ((but not all, wait till you see some of the other heart-melting sentiments! I bet we'll spot a few on our hop today!) , just stamp the occasion you want around it and you can wish someone a beautiful wedding or day, to simply "hello beautiful!" 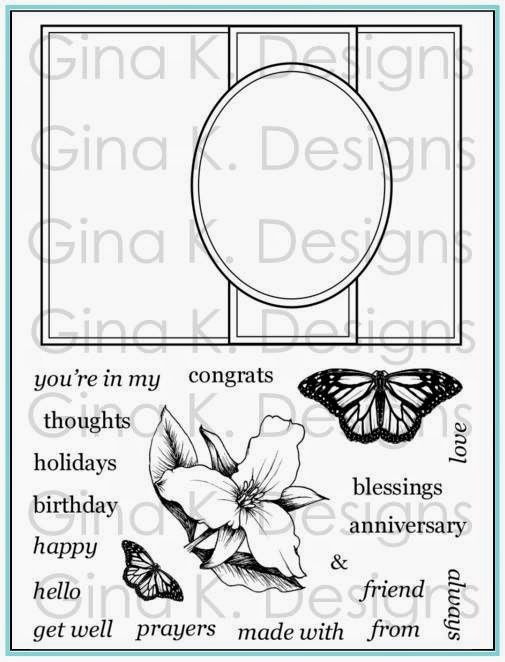 You will also love the little bee and butterfly images I've included in this set, they are a wonderful addition to bring all your nature cards "to life" as well as coordinating with all my other floral sets from Gina K Designs, like you just stepped out into the garden! :) I made the borders pop with a white Koh-i Noor pencil and colored the butterfly and tulips with Strong Red, Cardinal Copics, and Willow and Spanish Olive for the leaves. Shadows drawn with Warm Gray 1. Next we have Tami Mayberry's "Fairy Tales" set, I picked my favorite images and greeting from it to make this sample. 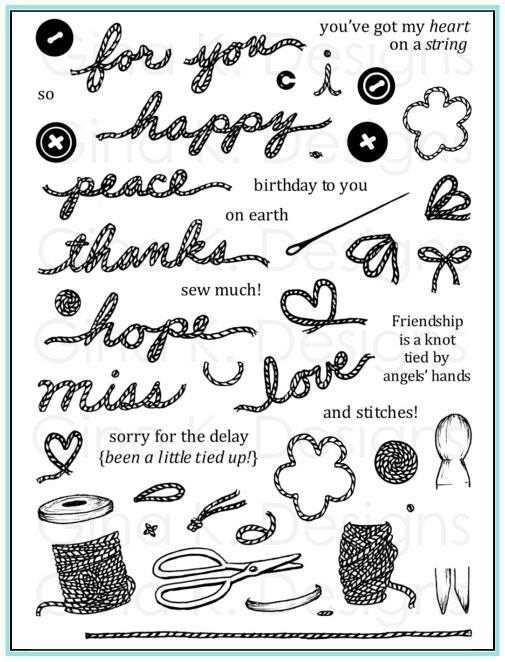 The doodling and whimsy of the Sugar Rush paper is perfect with this set and fun, wonky font she used in the quote! The oval border is from the new Stamp TV kit (you'll see that on Day 3!) After adding the greeting, I popped up Tami's crown, blinged up with rhinestones, and the winged heart below. Now it has kind of a "mirror, mirror, on the wall" effect! (Ribbon and Black Onyx and new Bubblegum Pink CS are also from the upcoming kit.) :) Here is a closeup to show the detail. I added little white dots to the heart to match the hearts in the DP, and I LOVE what that little bit adds! :) Using the fine tip of your different markers, making the letters different colors (remember doing that in school? LOL!) for the words you want to pop really brings your attention to them and makes it extra "happy happy"...! My next card uses Theresa's "Sending Sunshine" set. Perfect for Spring, it has several lovely park images, my favorite being this lazy tree and tire swing, can't help but think back to simpler, innocent times! I started with a Kraft base and stamped my tree on Pure Luxury White. After coloring the tree (a wisteria, you can really have fun choosing the colors for your flowers!) I stamped the tire onto scratch paper so I could cut off the rope part of the image (if you want to it's very easy to just stamp it in the spot you wanted, but I chose to make something interactive this time!) and then tied on some hemp twine, perfect for the old rope (here is the jute Gina K sells). The color is perfect with the natural Kraft! Poke a hole through the branch on the tree with a piercing tool and thread your twine through. Place a sheet of scratch paper over the top two thirds of your scene and sponge in some green ink until you are satisfied with your grass. TIP: Don't worry about getting it completely even, having some lighter areas will create the illusion of beautiful sunlight filtering through the tree and creating dappled patches. Remove the paper and sponge in just a bit of aqua ink, this will create a clear, bright day! It's a Surprise Party!!!! It is Stamp TV's 1st birthday and we just wanted to throw a little party for Gina! Happy 1st Birthday Stamp TV!!! To celebrate, a bunch of design team members and challenge hostesses decided to create birthday cards using a previous Stamp TV kit (or Gina K set). Leave a comment on every blog along the way because one lucky commenter will receive the all new Stamp TV kit that will be released next week!!!! (And....you're gonna LOVEEE it!) You will have until Sunday, March 14 at 8:00 p.m. central to post comments on all the blogs. The winner will be posted on Stamp TV on Monday! I am SO excited, the "Inspiration Mosaic" set will be featured in a publication's "Favorite Products" section in a just a few weeks, I have been on pins and needles waiting for this one to come out! :) Any guesses which?? I can't believe it's been a year since the inception of StampTV! In some ways, it's gone by in a blur, but in others I can barely remember what it was like before this community got off the ground, you know?! You also know Gina has all sorts of fun things and freebies planned, including a new and improved release party for our March release next week, so stay tuned! Here is a simple birthday card I made in honor of the occasion, kind of a "fill in the blank, paint by number" card if you will, using "Arranged with Love" and "Pressed Flowers"! 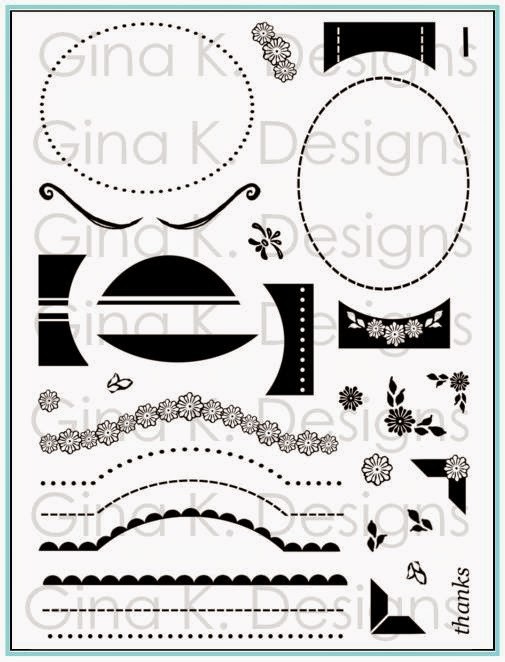 :) Start by stamping the Arranged with Love frame in black onto Pure Luxury White and trim. Now take the bold images from Pressed Flowers you want to spotlight in the frame, here I chose the roses and a shade of pink. Mask off the edges of the frame and stamp! Now I'm doing the rose leaves in light green. In addition to the post it notes for the straight edges, you'll also need a mask of the rose you cut from sketch paper to cover the flower before stamping. You can compare the different looks, both versions took under 10 minutes. If you have more masks cut out, it is a snap to add more flowers and color if you wish. If you'd like to add shadowed areas to these images instead of solid color, just color them directly onto your stamps with markers. * Then add a little bling with some pearls and rhinestones and a ribbon to take it up another notch! I hope this is helpful to show the possibilities with these two sets! :) Happy birthday StampTV! Thank you for such a fun year...and many mooooooooooooooooooore! *I am working on a post showing each of the bold images in the set which I have photoshopped to show the exact areas for you to add your darker colors to get realsitic shading when stamping these images, think you will find this very helpful! coming soon! Thank You STV Challenge Hostesses!